Holiday 2015 non-store retail sales grew 9 percent to a total of over USD 105 billion. Cyber Monday was the leading Sales day, the sixth year in a row, with more than USD 2.2 Billion spent on Desktop Computers alone. According to NRF, “Holiday sales in 2015 increased 3 percent to USD 626.1 billion — solid growth considering the unforeseen weather events across the country and an extreme deflationary retail environment.” NRF forecasted total growth, including online sales, of 3.7 percent. Adobe reported mobile devices accounted for about 25 percent of sales and 45 percent of visits to retail websites from Nov. 1-Dec. 22. According to MarketWatch, Adobe said online sales in 2015 holiday season were up 12.7% to $83 billion. More than 31 days during the period between Nov. 1 and Dec. 31 surpassed the $1 billion mark in sales, a record that exceeds 25 days in 2014. Online sales grew 56% year-over-year on Dec. 23, up to $920 million from $590 million in 2014. “It wasn’t until the very end of the season that we saw a significant surge in sales, which drove the 12.7% year-over-year growth,” said Tyler White, an analyst with the Adobe Digital Index. 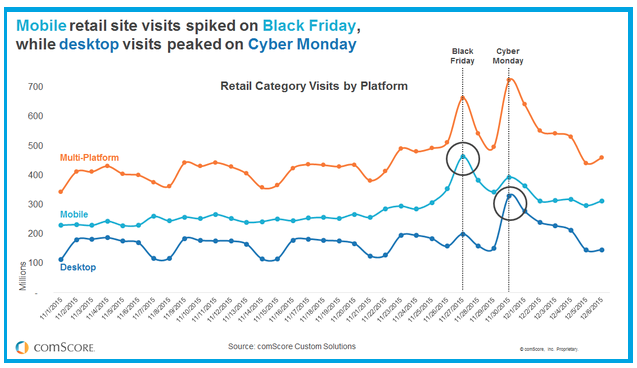 “Phone traffic exceeding desktop traffic some days was one of the drivers of that growth.” The buy-online-pick-up-in-store option was a growth driver in the week before Christmas. Adobe had forecast 11% overall growth for the season, White said. According to Marin, for the days between Black Friday and Cyber Monday, smartphone clicks grew by 87 percent YOY almost equaling desktop clicks. This reflects a dramatic increase compared to 2014 when smartphone clicks accounted for only 28 percent of all clicks. Cyber Monday beat Black Friday in terms of clicks and ad spends for both 2014 and 2015 with cost per click (CPC) prices markedly higher than any other day over the weekend. Decide on your campaign theme and core campaign idea. Start with analyzing the holiday data that is available to you from last year as well as Back To School campaign data. Highest priority is to make sure all budgets and metrics are aligned to factor in any changes in consumer behavior. Allocate budgets to optimize your campaigns across channels and devices with a single customer view. Key days are Thanksgiving, Cyber Monday, Black Friday and Christmas. According to an SEO firm,WPromote the best practice is to begin setting up heavily targeted paid ads, display (video/image ads) product listing ads, and remarketing ads in Google AdWords and Bing Ads at the earliest to coincide with seasonal days. Plan your Mobile engagement strategy. Optimize your every campaign for mobile, with mobile PLAs, a mobile website, and accurate device tracking set up in your analytics. In case you have an app then planning an app engagement campaign within your brand campaign can increase your conversions. Native Social Media Ads are important for Targeting Mobile users. Mobile App Promotion Ads can get your app installed and downloaded before the start of the holiday season. Develop content marketing and promotion initiatives as early as mid-October and launch content systematically during the downtime between holidays, instead of only in limited windows around the holidays themselves. Follow up your content marketing with Remarketing and Retargeting campaigns. Create holiday-optimized content, including an infographic or holiday gift guide, hosted on a website page instead of a blog, and leave it on the main site navigation until launch in order to get indexed in Google and start building equity as early as possible. This could improve CTR for holiday related terms. Embark on a campaign of social network posting about holiday gift guides, sales, wish lists, and other promotions as early as October but no later than the beginning of November; budget for paid/promoted social posts to increase visibility and audience reach, especially in the run-up to Thanksgiving. Set up a new email promotion workflow specifically for the holiday season based on what holiday products, promotions, or categories a user visits on your site. Personalize your promotions, in particular, mobile, social and email promotions; tailor specific offers to customers’ needs to increase CTRs and conversions and turn mobile, email and social channels into huge revenue generators. Look for the mobile moments that are right for promoting your offers with push messaging campaigns. Create a Follow through marketing plan to optimize ROI from your campaigns, by analyzing reasons for cart abandons and setting a remarketing or an email marketing campaign.